So what have I been up to recently? Well, the last time it snowed, I was lucky to be one of five foodie bloggers invited to take part in the Stacie Stewart Baking Masterclass over in Cactus studio's in London, the home of Saturday Kitchen! standing in the Saturday Kitchen! Stacie helping the Lunchbox Lady out! Problems with the mixer! Initially we were totally aware of all the cameras whirring away, filming every reaction, every flicker of a smile, every nervous titter. We soon settled down however as this was a layered dish to be mastered and being of competitive nature, I was keen to perform well! Now generally my baking goes quite smoothly. I am not sure I have ever had a real disaster but I do know some bakers that have experienced their cake dipping as they take it out the oven, or just collapsing half way through cooking. Stacie however was full of advice and tips on how to avoid such blunders. Perhaps the biggest trick I picked up on the day was that everything, and I mean every ingredient for a cake has to be at room temperature. Even the eggs. What's more cornflour is substituted instead of the baking powder to help be the "scaffolding" for the cake, and thus avoid the cake from dipping during the baking process. Then add one egg, followed swiftly by one tablespoon flour, followed by the next egg, tablespoon flour and the next egg.. and so on, then without the mixer, add the final flour and fold that in by hand. (This bit is new, it has to be quick, alternating flour and egg, then stop with the mixer and finish off by hand). Add in the vanilla essence at this stage. Fold in. No overworking of the cake mix. Dollop into the lined and greased tin and pop into the pre-heated oven. Now I have done some baking before, I've been taught how to pipe with a piping bag, how to avoid getting icing at the top of the bag and have had loads of practice with the kids. And I mean loads! It's what we love doing in the winter months. Embellishing cupcakes, making up gingerbread houses and piping the decorations on. We're becoming quite a baking household! Last Christmas we had 3 gingerbread houses, with each child wanting to pipe their own gingerbread house! And now what with Tuna having won that Fiona Cairns parcel cake competition at the tender age of 14 over on Facebook, the bar in the household is being raised higher and higher. We've even worked out how to turn ice cream cornets into trees looking as if they are totally snow bedecked. But perhaps I should save all that for some other posts and just link them all up! So back to the day, Stacie demo'ed, we took notes and then it was our turn to replicate the dish! Now I really wish George had been in my goodie bag to take home! He was the friendly help about the kitchen, very kindly washed all my dishes and weighed out all my ingredients. I would just call "George!" and he would be there to help! All I had to do was separate the eggs with a camera almost perched on the end of my nose and smile for the camera! It was way more complex that that. We baked up Stacie's twist on the classic Lemon Meringue Pie: Lemon Meringue Pie Cake. Now I have never made homemade lemon curd, nor made my own swiss meringue. Pavlova yes, but swiss meringue, no. (It's a bit like marshmallow or those jars of Fluff). So it was to be a day of firsts! So we made all these elements. Allowed them all to cool. Then we simply layered it all up - starting with cake, then lemon curd, then pastry, then lemon curd, then cake, then lemon curd, then pastry then lemon curd then cake. I hope I got the order right there? Then the layered stack like a giant cake sandwich was all topped off with the swiss meringue. Now here I came into my own *fluffs up chest proudly* yes, because I have had lots of practice with piping, away from the camera's, in my own kitchen, with the kids watching, or doing their own piping. So I was rather a dab hand at piping. 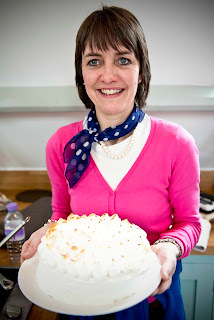 Then at long last, I was allowed to use the blow torch to just tinge the meringue. Perfection! And as proud as punch! Here's a closer look in case you can't see the piping in detail! So have you taken part in any cookery classes or baking masterclasses? What top tips would you share when it comes to baking? And lastly, what baking do you do for picnics and lunch boxes? Note: opinions are my own. I was invited to attend the day in return for the review.